Drummer Øystein Jevanord was interviewed by Christopher Hopkins for the Headlines and Deadlines fanclub magazine back in 2007, in which he mentioned that a-ha did two concerts in Iceland near the end of their first world tour in 1987, following the Japanese leg in June/July. 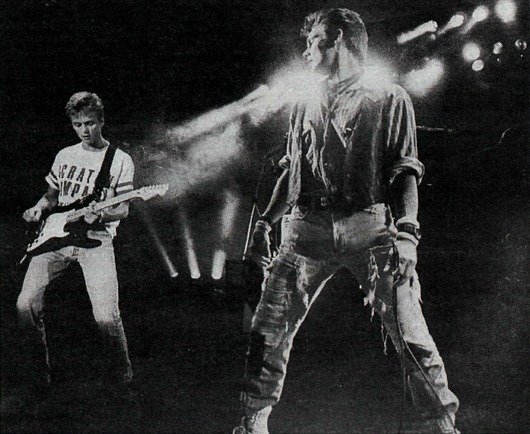 The former Bridges drummer toured with a-ha as an extra percussionist that summer, but in the interview with Hopkins he didn’t share further details about these dates. Strangely, those two concerts hadn’t been mentioned anywhere else that I was aware of. They hadn’t appeared on any lists of tour dates, neither online nor in a-ha books. In the following years no further details emerged about these mysterious dates. 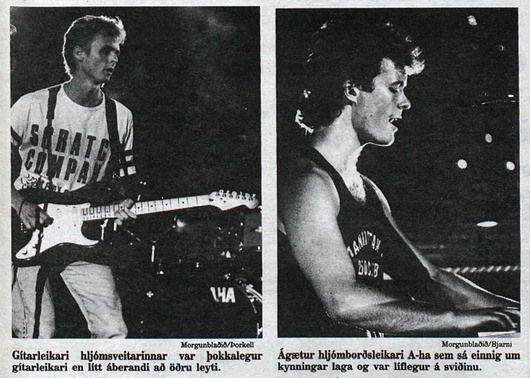 However, a while ago I was searching through an Icelandic newspaper archive and found solid evidence that these two concerts actually happened. The concerts were held at the indoor arena Laugardalshöll in Reykjavik on 17 and 18 July 1987. They seem to have been late additions to the summer tour and were first announced a couple of months before, on 19 May. This may be why the dates largely went under the radar back then. One of the press reviews seem to say 4000 people attended the first concert. On 17 July, prior to the first concert, the band also attended the Icelandic premiere of The Living Daylights. This is something they have later mentioned in interviews; how they couldn’t attend the world premiere in London because they were on tour in Japan, but did manage to attend the Icelandic premiere instead. Adding these shows to the previously rediscovered 1987 Japanese dates, this brings the total number of concerts on the 1987 summer tour up to 25. See the updated list of 1986/87 tour dates here. 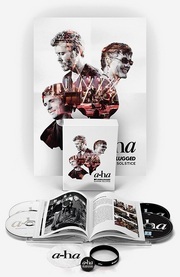 a-ha have been nominated for the 2015 Spellemann Awards, in the Pop Group category, for their Cast In Steel album. This is the first time since Minor Earth ⎜ Major Sky in 2000 that a-ha have been nominated in this category. The award show is held at Oslo Spektrum on 30 January, and will air live on NRK1. See a list of all the nominated artists here.